If you use Mozilla Firefox web browser on two or more computers or laptops, you surely think about how to synchronize Firefox data between these computers. There are some extensions already you can use for the backup or synchronization task. There was a nice extension from Google called Google Browser Sync, but Google stopped its development because they provide their own browser Google Chrome with synchronization option. There is also Xmarks extension, former called as Foxmarks. This extension is good for a common synchronization between different browsers, but it doesn’t backup the complete Firefox profile with data, history, passwords and extensions like FEBE. The Mozilla worked on Weave Sync for a long time. At first, there was only using your own WebDAV storage possible. Now you can use it too, but as default, your data are encrypted and uploaded to Mozilla’s servers. The current version of Mozilla Weave Sync 1.0 supports bookmark sync, browser history sync, synchronization of the stored passwords and tabs sync from your Firefox. 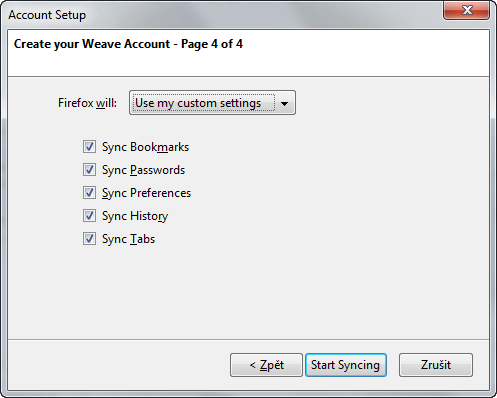 So using the Weave Sync you can easily synchronize the common used Firefox parts. 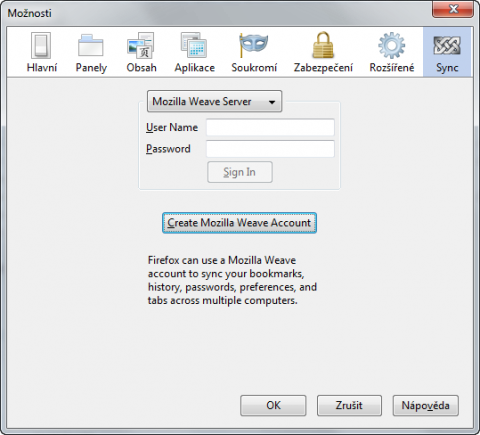 To be successful with Firefox backup and synchronization you have to install the same version of Mozilla Weave Sync on all Firefox installations. But it shouldn’t be a problem. After the Weave Sync installation and Firefox restart it is ready to synchronize. Click the Not Signed In button at the bottom of Firefox windows and continue with Preferences menu item. You will see the known Firefox Preferences window with a new item Sync. Click the Create Mozilla Weave Account button. The new wizard will appear. Provide you username, password and encryption phrase (12 characters at least and you shouldn’t forget it), select items to backup and synchronize and click the Start Syncing button. The wizard will do all necessary settings and you will be switched back to the Firefox preferences window. Now you should see you username for Weave Sync and the synchronization process will start after a while. You can check the synchronization status in the Firefox status bar at the bottom of its window. The list of synchronized items, your password and the passphrase for the encryption could be changed anytime. I appreciate the user can decide between the Mozilla’s servers or his or her own WebDAV storage on own server. Mozilla Weave Sync is useful Firefox extension if you would like to be sure you will not lost your password, bookmarks, history or tabs. Personally, I will use it together with FEBE which do the complete Firefox profile backup.